On this day we drive to Rangdum via kargil. Kargil is the nearest village to Nun Kun in the Suru valley with amazing landscape. From Padum we continue along a dusty Jeep track. En route, we’ll come across Shila and Bardhan villages. Bardhan is known for its valley monastery (3620m), which is closely associated with the Drukpa order of Hemis monastery. It is also famous for its huge and beautifully engraved (mantras) prayer wheels. From Bardhan it will take another 2½ hrs (approx.) along the Tsarap River before we turn off to the Kangla, and mount to a plateau and the village of Reru via Mune Monastery (3900 m). This day very interesting because you have a chance to see Icher village which is biggest village of lung nag valley. 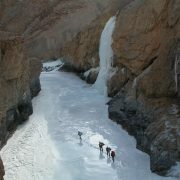 An easy walk for 4 to 5 hour along the blue zanskar river. 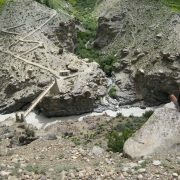 The trail to Phuktal (3850 m) follows the right bank of the Tsarap River and enters splendid gorges for sometime before reaching a makeshift bridge. After a short walk we will come across a small plateau with sprinklings of chortens and prayer flags. Here we’ll have an amazing view of Phuktal monastery, one of the most fabulous sights in the Zanskar valley. The sight of the monastery leaves a lasting impression due to its unique creation. It is on a limestone cliff, with the main assembly hall carved out of a huge cave and the monks’ residences scattered down the hillside. The spring that gurgles deep in the cave is still out of bounds for women. Inside the monastery there is an inscription of Cosma de Koros (the Hungarian historian, 1825-26), one of the first Europeans to visit the Zanskar region. After visiting the monastery, we’ll come back to Purne for an overnight of rest. Now it’s time for us to start a fresh venture with the crossing of the bridge in the gorge. Before the steep ascent to the huge fertile plateau of Tetha village (3980), we keep to the trail along the right bank of the river. This is an excellent path with a minor climb and descent marked by a progression of well-maintained Stupas of the village of Kuru (3990), a major centre for livestock breeding. After Kuru the trail descends back to the right side of the riverbank toward the village of Tanze (3850m). From Tanze, it’s an easy short walk to the route that joins up with hiking tours Darcha-Padum by the Baralacha & Phirtse la. 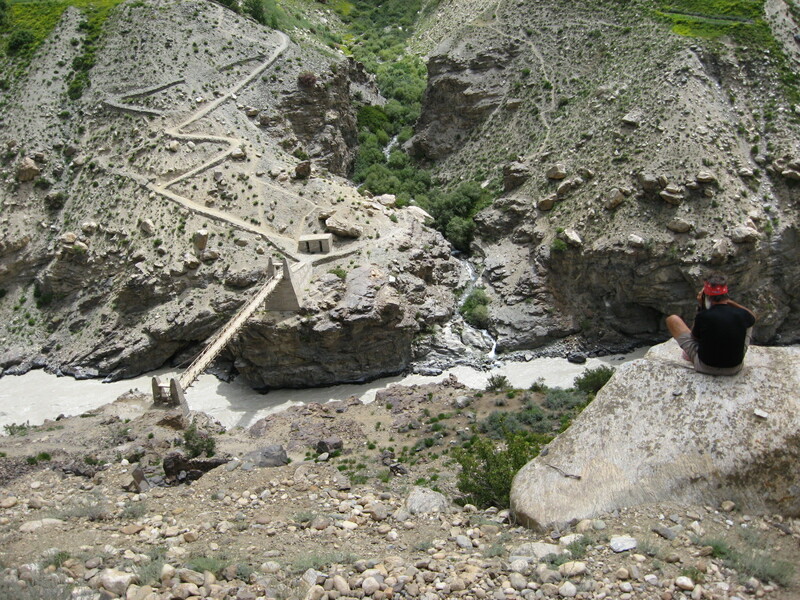 The trail from Table gradually ascends to the village of Kargyak (4050m) on the left bank, the highest permanent settlement in the Zanskar region. We climb up easily towards a majestic rock tower known as Gonpo Rangjung. After passing the awesome rock-face, there are plenty of passages to the upper reaches of the Kargyak River. The path then heads to the beautiful yak grazing pastureland known as Lakung (4470 m). This is one of the most rewarding places for encampment. 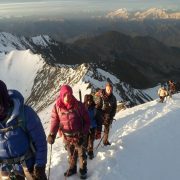 On this day, we’ll have a good breakfast to generate the extra energy to meet the challenge of Shingo pass (5090m). Though not tough by Himalayan standards, it is a trying one and can be accomplished in a couple of hours. The gradual ascent leads to the top of the pass. The view can leave us speechless with its panoramic scenery, a backdrop of 6000mtr snow-capped peaks defining both the main Himalayas and the Baralacha Range. A series of prayer- flags mark the Shingo la. The descent path is easy and well trodden. It starts with a small steep route leading to a slope to the right side of the valley; passes shepherds’ huts at Chumik (4640m) and a further descent leads us to the meadowland campsite of Rumjak (4290 m). 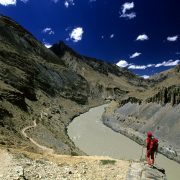 We continue on the right bank of the river, where the descent is rather gradual until the last section of the Zanskar Sumdo (3860m). 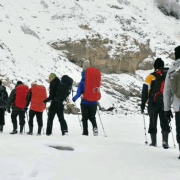 Before reaching Zanskar Sumdo, the path is easy; but we need to be alert of the steepness. After a steep descent at the intersection, we cross the river on a manned pulley bridge. Further on, the trail runs along the far bank towards boulder fields until Pallamo. There, we will camp for the last night of our trekking, ending our thrilling adventure on prepossessing greenery. On the last day, we will do the easiest and shortest hike on this adventure. We will pass the village of Rarig (3430m) down the valley, continuing in a spectacular gorge along a dusty path until the final countdown to Darcha. From there we will drive back down to Manali.